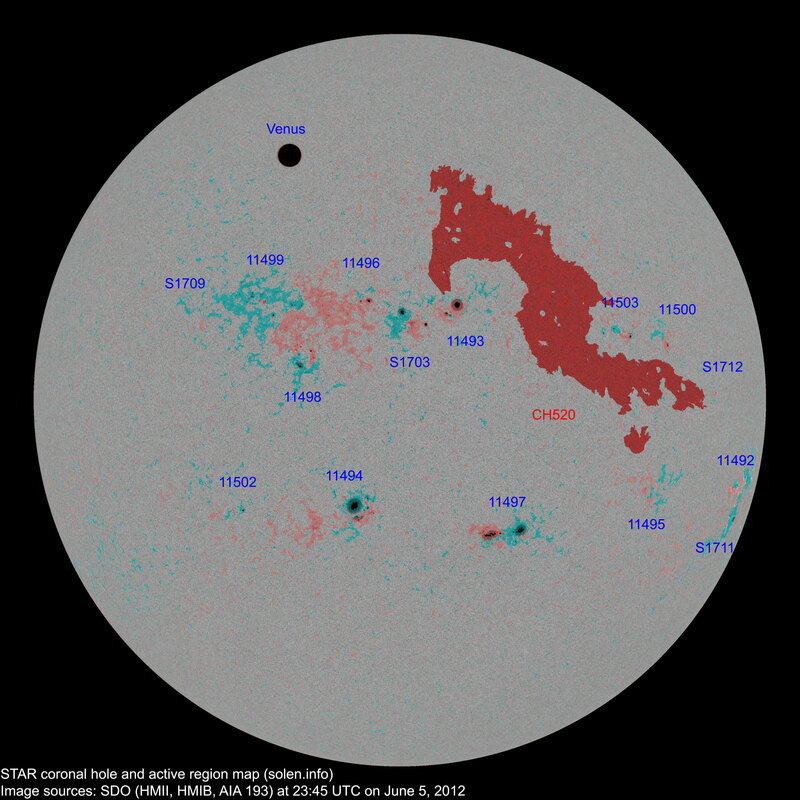 Last major update issued on June 6, 2012 at 05:15 UTC. 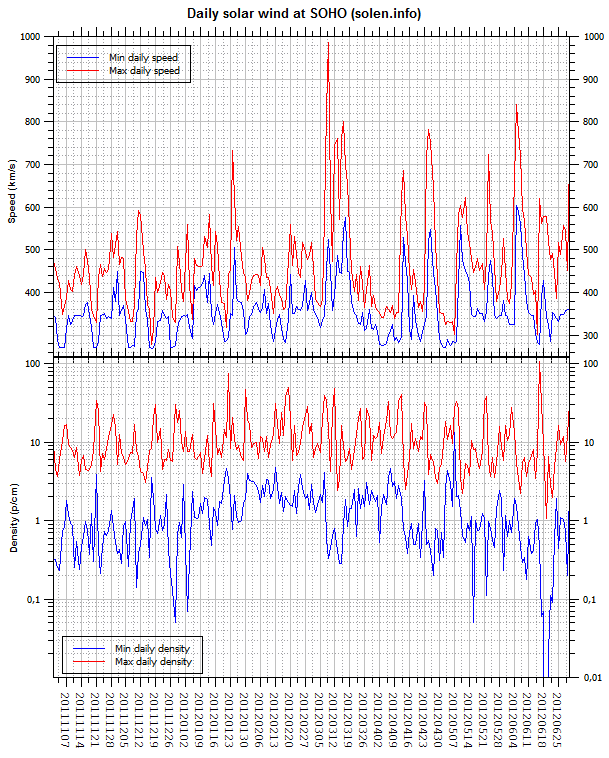 The geomagnetic field was unsettled to active on June 5. 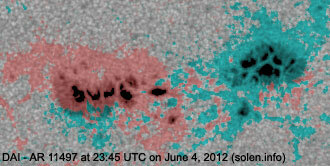 Solar wind speed at SOHO ranged between 603 and 840 km/s under the influence of a high speed stream from CH520. 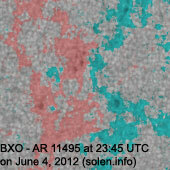 Solar flux measured at 20h UTC on 2.8 GHz was 138.7 (increasing 11.4 over the last solar rotation). 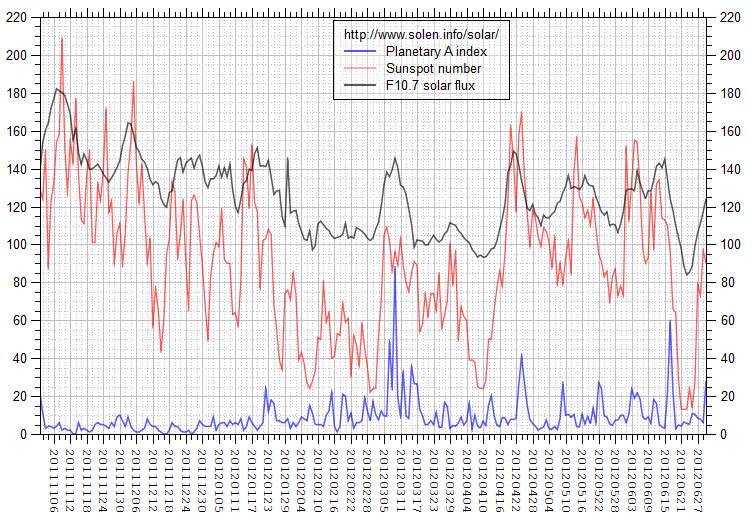 The Potsdam WDC planetary A index was 22 (STAR Ap - based on the mean of three hour interval ap indices: 21.6). 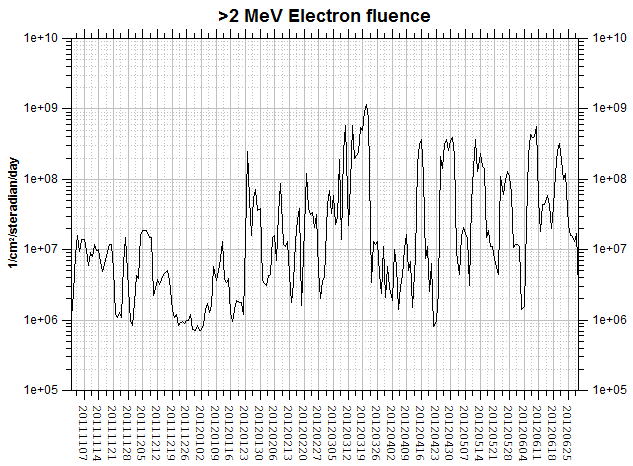 Three hour interval K indices: 34434344 (planetary), 34324333 (Boulder). 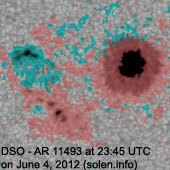 Region 11492 [S13W70] reemerged with two small spots. 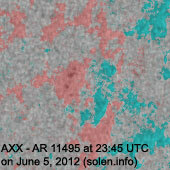 Region 11493 [N13W08] developed polarity intermixing and remained quiet. 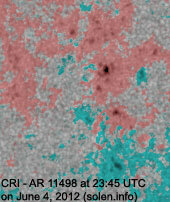 Region 11494 [S19E07] developed further with a new penumbra forming to the south of the large penumbra. 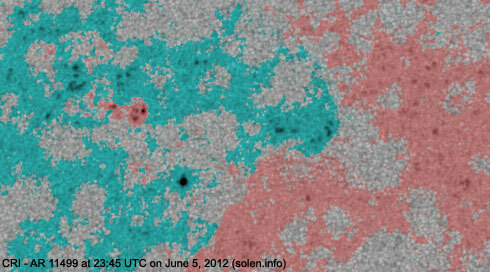 This new penumbra contains both polarity spots and there is a chance of a minor M class flare. 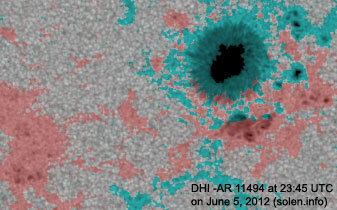 Region 11495 [S15W44] decayed slowly and quietly. 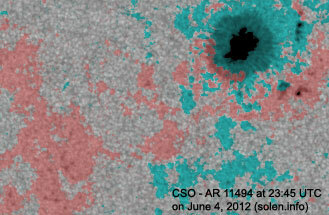 Region 11496 [N13E06] decayed slowly and could merge into AR 11499. 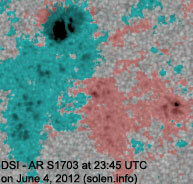 Region 11497 [S22W18] matured with umbrae merging inside the two major penumbrae. 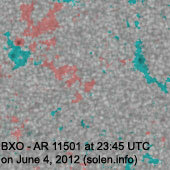 Region 11498 [N05E16] developed slowly and could become an interesting region with the poorly defined inversion line in a mostly east-west direction. 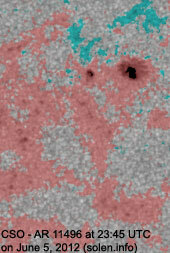 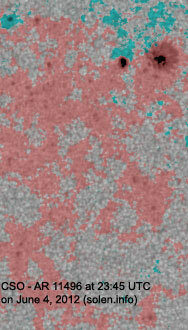 Region 11499 [N13E19] developed further adding many tiny spots. 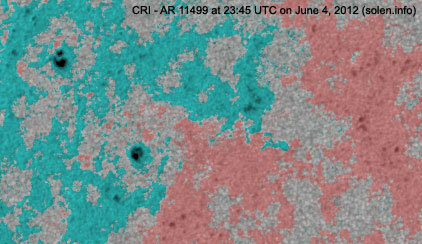 The region is the most active on the disk despite no mature penumbra on any spots. 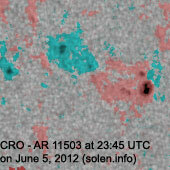 There's polarity intermixing and a chance of an M class flare. 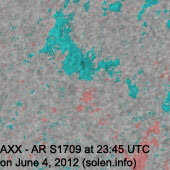 Region 11502 [S19E27] decayed slowly and quietly. 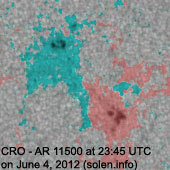 New region 11503 [N10W37] emerged on June 4 and was numbered by SWPC one day later. 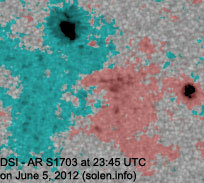 S1709 [N13E37] was quiet and stable. 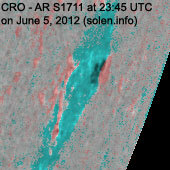 S1711 [S18W75] developed slowly and quietly. 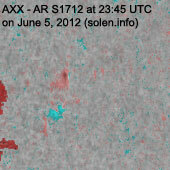 New region S1712 [N01W60] emerged near the equator with a single spot. 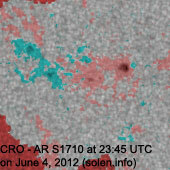 June 3-4: No obviously Earth directed CMEs were observed in LASCO or STEREO imagery. 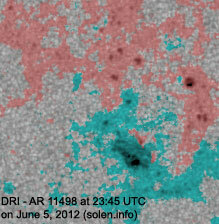 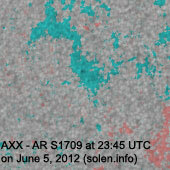 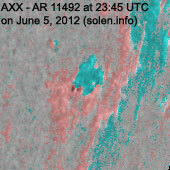 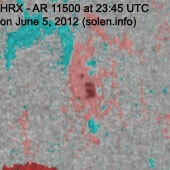 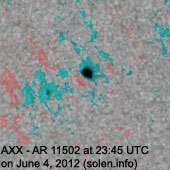 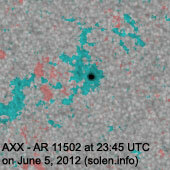 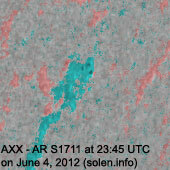 June 5: A filament eruption near AR 11493 and close to the central meridian was observed beginning at 19:30 UTC. 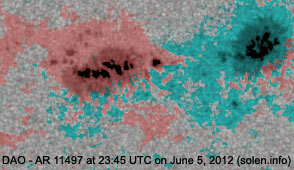 A small CME was observed at 20:39 UTC in STEREO-A. 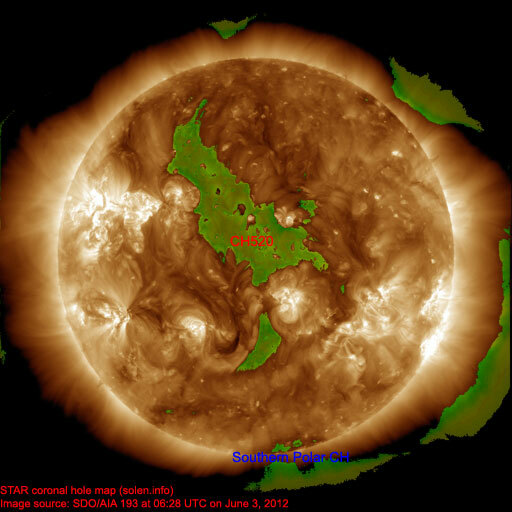 The geomagnetic field is expected to be quiet to active on June 6 and quiet to unsettled on June 7-8 due to effects from CH520. 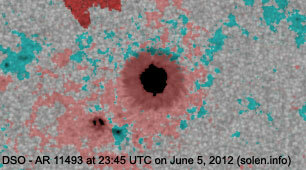 There's a slight chance of weak effects from the CME observed on June 5 late on June 8 or early on June 9.